Some of my English friends have asked me to post about English mouthpieces. 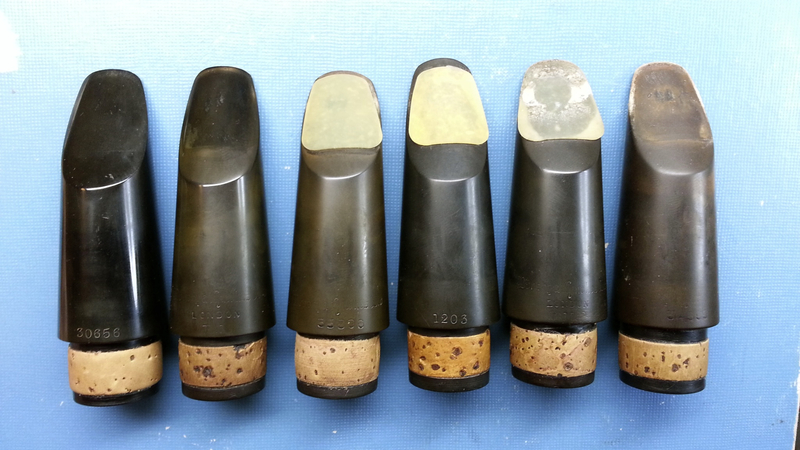 Pictured is a lovely collection of Boosey & Hawkes Bb clarinet mouthpieces – circa 1934 – 1946. They are extremely rare and unusual mouthpieces, and are hardly ever found today. I have restored and maintained this collection over several years for London based clarinettist, Jonathan Parkin. All of these mouthpieces were specifically made for the wide bore clarinet created shortly after the merger of Boosey & Co and Hawkes & Son in 1930 – what become known as the 1010. The 1010 has a large, cylindrical bore measuring around 15.24mm (0.6 inch) from the top of the mouthpiece bore down to the beginning of the flare in the bottom joint. The mouthpiece bore must be this size for the clarinet to tune properly. From my research at the archives in the Horniman Collection in London, and the University of Edinburgh, it appears that at the time of the merger, the newly formed company based the design of the 1010 primarily on the Boosey & Co clarinets – specifically the 200 model, which had a similar bore size. Hawkes & Son were also making very fine clarinets at this time, which were widely preferred in London; however the manufacturers chose to use the Boosey & Co design, and abandoned the Hawkes clarinet forever. Pre 1950, Boosey & Hawkes employed several very skilled craftsmen who assembled and crafted their clarinets and mpcs. These mouthpieces were all hand milled and tooled from solid ebonite. Many of them were made for a particular clarinet and stamped with that instrument’s serial number – for example, 31026, which dates to 1935. Others were made for the London & Paris series of wide bore instruments, which were essentially 1010s, but with the bodies imported from France, with wooden tone holes (the UK-made 1010s had ebonite tone holes). These instruments had different serial numbers – for example, 1114. Pre-war mouthpieces were also sold individually, without a serial number, stamped simply with the model number (e.g. BM) and the facing type (1-3). The BM2 was a particularly popular model. The design of these mouthpieces is different from, say, a French Chedeville mpc of the time. These mpcs had a large, long window, with a wide A frame chamber and a deeply cut baffle. They are quite slender, and are generally a few mms shorter than a more modern mouthpiece. The overall shape of these mouthpieces changed during their roughly twelve years of production (1934 – 46), from slim, with a long beak in the mid 30s (much like the Boosey & Co mpc models of the late 1920s), to much fatter and shorter in the beak by 1946. The facings originally used on these mouthpieces were very close, most under 1mm, and very short in length, when compared to a modern facing. Most players during the 1930s in England still played in the close facing tradition of the early 20th century – Charles Draper was a leading exponent of that school. Frederick Thurston, who was a pupil of Draper and had adopted the new 1010 clarinet in the early 1930s, played a very close facing Boosey mpc – I have examined his mouthpiece (circa 1934) first hand, and it is incredibly close by modern standards, well under 1mm tip opening. At the time, Boosey offered their classical mouthpieces in varying lengths, not tip openings. Interestingly, many players in the 1930s adjusted their own mouthpieces, or went to craftsmen for help. I am told Thurston had his mouthpieces adjusted by Mr Quilter, who worked for Boosey & Hawkes for a time. Reginald Kell famously relaid his own mouthpieces – and quite skilfully, judging from the examples I have seen. Generally speaking, these mouthpieces function best if they are kept in a close or medium facing – any wider and it risks losing focus and resonance. Orchestras today are much more powerful than they were in the 1930s, also the style of sound has changed, so a slightly more open facing and contour than original is required if one is to play these mouthpieces in a modern context. Currently, the mouthpieces in this collection have a medium close facing and medium length. After WW2, Boosey & Hawkes began producing mouthpieces made with blanks from Lelandais in France, and later into the 1960s changed their designs radically to resemble more mainstream French mouthpieces. As with their clarinets, the quality control of Boosey mouthpieces plummeted post war, as they prioritised large scale production over attention to detail.